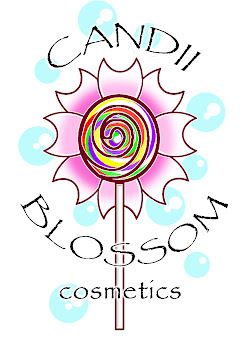 Candii Blossom Cosmetics: New pictures...How bout an Auction?!?! New pictures...How bout an Auction?!?! I just posted 7 new pictures of "old" piggies that CBC has. The old pictures are kinda gross looking so I've been slowly updating them all. So since I have all of these babies in their little beds (jars) I figured we could have a little auction for ALL seven of them together! This Auction will END at midnight!. So we have Twisted Metal. Black, not BLUE! the picture kinda throws it off cause of the aqua sparks that are in it and it has purple sparks too (: Pot O' Gold. Pretty gold with lots of sparkle! Peppermint. Pretty red metallic with lots of sparkle! Gypsy Smoke. A matte black!! Every girl needs a good black in her life! Hyacinth! A matte purple! Nuf said (: Skittlezz'z Pop Rockzz!!! One of my many favorites! Names after a great friend (: Purple with lots of purple and blue shimmer! Last by not least we have Erin! She is from the St. Patty's Day Collection! Lovely apple green with copper sparks!! 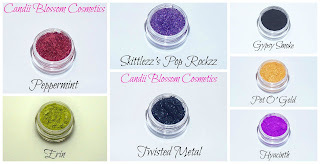 Starting bid $15 Increments will be $1 Shipping $3 unless winning bid is $25 or over. This is WELL below retail price for all of these! Please comment with your paypal when making a bid.